Brazilian President Michel Temer agreed to lower diesel prices in an effort to end a weeklong strike by the country's truck drivers. Thousands of truckers across Brazil, angry at gas prices that have more than doubled since 2016, have refused to work for the past week and blockaded roads across the country. In addition to agreeing to subsidize gas, Brazil's president said toll fees for empty trucks would be waved and a minimum freight fare for truckers would be instituted. Gas prices will be lowered for 60 days and readjusted on a monthly basis thereafter. The president said the prices would be cut 46 Brazilian cents, or $0.13, per liter. "We have done our part to ease the problems and suffering," Temer said in a televised address. Prior to his concessions, the president threatened to send in armed forces to clear the blockades. Whether the striking truckers will agree to the president's offer remains unclear. The terms of Temer's proposed agreement were published in the government's Official Diary on Sunday, a prerequisite for an end to the strike as demanded by the truckers' union. 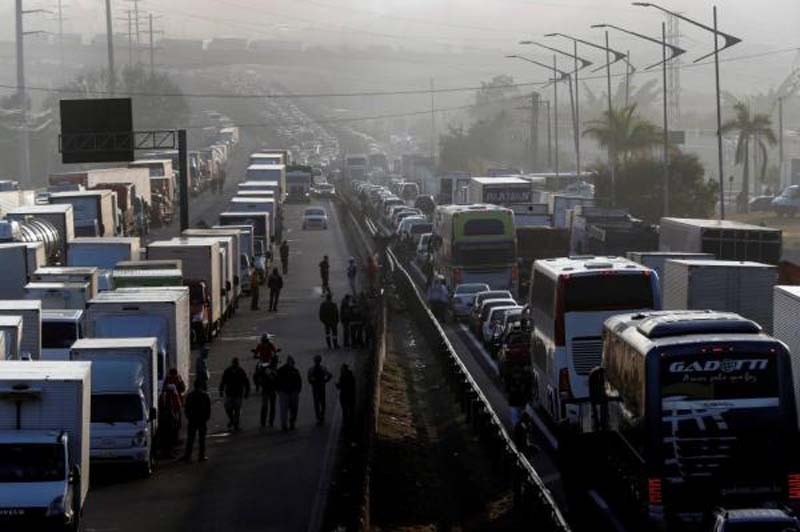 "If it's in the Official Diary, our recommendation is for the concessions to be accepted," Autonomous Freight Transporters Union, Sinditac, President Carlos Alberto Dahmer told Brazilian website G1. Much of Brazil's economy has been at a standstill since May 21, with grocery stores running out of goods and hospitals running out supplies and medicine. On Friday, Sao Paolo, the country's largest city declared a state of emergency. To alleviate the pressures of the strike, security forces escorted supply trucks to hospitals and diesel trucks to gas stations. Temer replaced former President Dilma Rousseff after she was impeached in 2016. He has grown increasingly unpopular, with a recent poll showing up to 70 percent of the country disapprove of his administration. Temer says he doesn't plan to run for re-election.